The US has imposed military sanctions under Caatsa against Russia and the sanctions extend to countries that engage with Russia on defence. 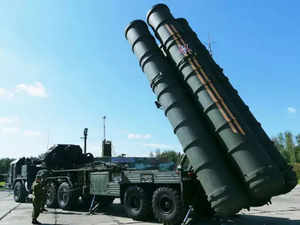 American waiver of Caatsa will avoid complications in India’s purchase of the S-400 defence system from Russia. American waiver of Caatsa (Countering America’s Adversaries Through Sanctions Act) is likely to be in the agenda of the Indo-US 2+2 dialogue in New Delhi on Thursday. American waiver of Caatsa will avoid complications in India’s purchase of the S-400 defence system from Russia. The highest political and diplomatic engagement between the two nations this year will see external affairs minister Sushma Swaraj and defence minister Nirmala Sitharaman holding talks with secretary of state Michael R Pompeo and defence secretary James Mattis and concluding key defence pacts and arrangements. The US has imposed military sanctions under Caatsa against Russia and the sanctions extend to countries that engage with Russia on defence. However, a person familiar with Indo-US ties said “Caatsa is a US law and it has to find a carve-out for India...the US should keep in mind its strategic partnership with India in making its decision”. India is likely to convey this message during the summit as it plans to go ahead with purchase of S-400 system from Russia irrespective of the US position. The Pentagon’s senior official handling issues relating to Asia, Randall Schriver, however, said that the US cannot guarantee that India will be exempted from sanctions if it purchases weapons and defence systems from Russia. S-400 is known as Russia’s most advanced longrange surface-to-air missile defence system and one of the world’s most advanced system. Last month, the United States had described India as an all-weather partner and noted that the 2+2 dialogue was an important opportunity to enhance engagement on a range of diplomatic and security issues. Counter-terrorism partnership, designation of International terrorist organisations and individual terrorists, sharing of information and cooperation in Financial Action Task Force would also dominate the talks. India will insist that more Pakistan-based outfits be designated as terrorist organisations in the backdrop of US curtailing funds for Islamabad.